I have been living in 19th century Paris for the past week, viewing it through the eyes of Julien Sorel who is Stendhal’s hero in Scarlet and Black. I have been held captive by his actions every minute of our acquaintance. Julien begins his life as many things: a peasant, a carpenter’s son, a Latin scholar, the lover of the Mayor’s wife (Madame de Rhenal) at age twenty. But, when he goes to seminary, and then eventually on to become secretary for the Marquis de la Mole, Julien becomes a Parisian dandy. Not that he can compete with the rich young gentlemen of the day, who bore the Marquis’ daughter, Mathilde, to death. No, Julien adheres to liberal views which he is not shy about sharing; he is also aware of the hypocrisy he exhibits in not having enough independent wealth for even his daily bread. In fact, he feels that all priests are hypocritical, and it isn’t until the final chapters of the novel that Julien believes in God himself. He has been far too preoccupied with love affairs, social status, and the glory he has found in living as the nobility do. Who can say how deep was his love for Madame de Renal? Surely at the time they felt their love to be true, but it could not be sustained with her a married woman. Probably it was inevitable that he fall in love with the Marquis’ daughter at his next place of employment. But, you can see how that love could be called into question as well, once her father sees Julien’s penniless status as compared to the Marquis’ power and riches. All of which Julien could inherit upon marrying Mathilde. Stendhal makes us look at status and ambition, while examining the priests and nobility, in this novel which often struck me as overly dramatic. Yet, I can forgive a novel written in 1830 for making me want to cry out, “You vile brutes!” after certain passages. The story is what makes it compelling, as I alternatively cheered for Julien and longed to slap him for his stupidity. What has changed between people of his era and people of today? 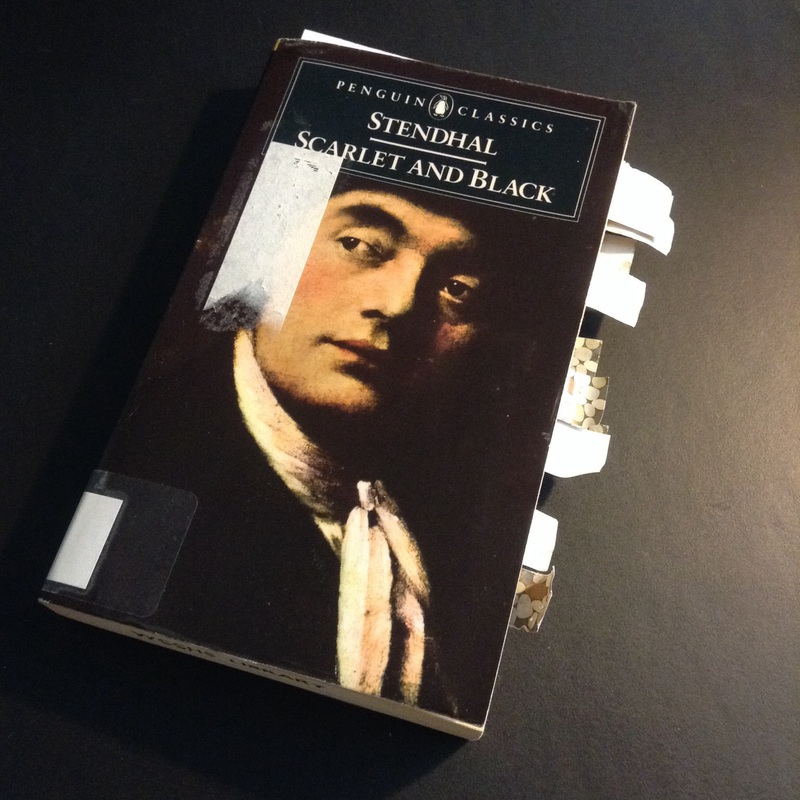 As I read, I marked quotes from Stendhal that seemed particularly insightful. Many of them apply to French culture today as I think back on the times that I have been in Paris. Below are some of the passages I highlighted. On entertaining guests: “The Marquis was absolutely correct in his behaviour to his wife; he took care to see that her drawing-room was adequately furnished with guests – not with peers, for he found his new made associates insufficiently noble to be entertained at his house as friends, and not amusing enough to be received in an inferior footing. Gosh this brings back memories of my teenage years when I was reading many authors from European countries. This was one I struggled with a bit but I can’t remember why. Yes, I struggled wih it a bit as well, although I thought that was in part because of the medication I’ve been on from some oral surgery. It certainly didn’t flow as smoothly as Madame Bovary, or Anna Karenina, both of which are some of my favorite classics. This was a romantic story, though, and somehow I thought it was going to be more about war or politics than love. But, that was the underlying theme, which I’ll gloss over for Audrey below. And I think I read this in college, though I didn’t remember the story at all. I’m glad you delved into it, for our sakes! One of the problems with writing a book review, for me, is that I’d love to tell the story more completely and yet that would ruin a fresh read for anyone else. However, I will recap the story here under spoiler alert. (Spoiler: Julien is born to a peasant’s life as a carpenter’s son. Yet, his remarkable memory has enabled him to memorize the entire New Testament verbatim. This special talent, and understanding, leads him to become the tutor of the Mayor’s children; soon Julien is involved in a affair with the Mayor’s wife. When they are discovered, they cleverly sidestep the issue, and Julien goes away to become the secretary for Marquis de la Mole. He is well received here, included in the family, but again he becomes involved in a love affair this time with the daughter. When she becomes pregnant they resolve to marry, and her father promises to give a generous some and title to Julien so his daughter can continue to be well cared for. But then, the father learns through a letter from the Mayor’s wife (which she was forced to write by her priest) that Julien is a scoundrel. Great commentary on this work. I have wanted to read this for years but have not done so yet. In my opinion, characters that we are root for but who are terribly flawed are one of the elements that makes a boo great. Brian, your compliment means much to me as I found this book somewhat difficult to review. First, there was the problem of not giving too much of the plot away. But, it is also a somewhat complicated novel with much to sort out in terms of what Stendhal wants to communicate to us. Is he making fun of hypocrisy? Certainly, but there is so much he more I’m afraid I didn’t do him justice. I finally settled for marking the passages which seemed especially significant to me. The last one is my favorite. Although I have lived in France, and even purchased my wedding dress there many years ago, I would never deceive myself that I in any way belonged. There were many things I admired about Julien, such as his straight forward, “freethinker” point of view. But, it seemed that he often went where the wind blew him, too. I guess he thought he fell in love with Mathilde because he knew that the situation with Madame de Rhenal was impossible, but the whole thing turned out so tragically! I’m glad I read this classic novel, one I’ve been meaning to read for many years. Hi Belleza! Before I start, thanks for visiting The Marmelade Gypsy! Isn’t Paris in July fun? I love discovering new books, films and such and this looks like a terrific read. Thanks for alerting us to it! One of the books I enjoyed reading.The bold desire of Julien Sorel.